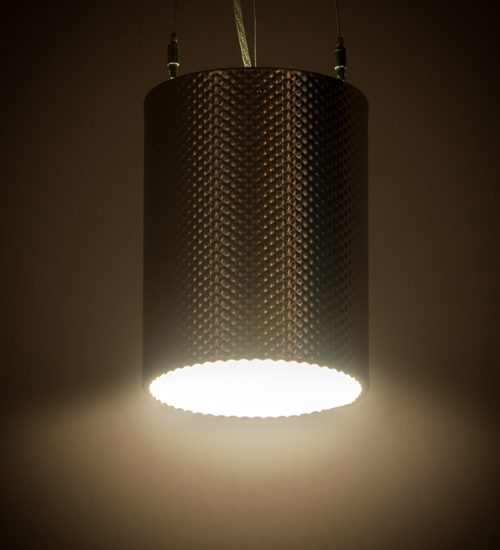 Description: Add striking industrial chic to your decor with this Metal-Tex Weave pendant which features a durable, stunning texture that will add character depth and intrigue to a residential, hospitality or commercial environment. The cylindrical shaped pendant, which is featured with hardware in a striking Brushed Stainless Steel finish, is enhanced with a Statuario Idalight bottom diffuser. Robust illumination is delivered with integrated LEDs that are energy efficient and provide long lamp life. Custom crafted in the USA, this pendant is available in custom sizes, styles and finishes, as well as dimmable energy efficient lamping options. The fixture is UL and cUL listed for dry and damp locations.